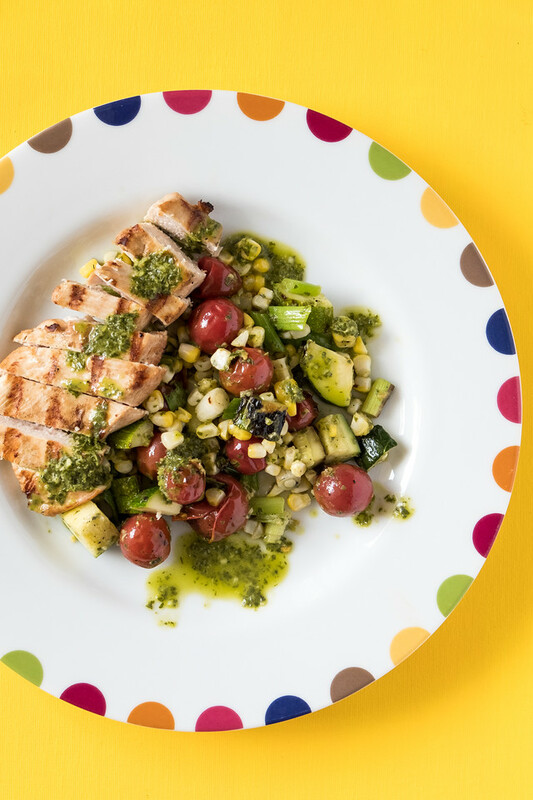 This Lime Grilled Chicken with Vegetables and Herb Sauce is like summer on a plate with corn, tomatoes and zucchini with a basil sauce! Post may contain affiliate links, full disclosure on side bar! Click here to pin this Lime Grilled Chicken with Vegetables and Herb Sauce now! While I adore fall, I am definitely going to miss the produce of summer. Even the zucchini. I can think of no better way to say goodbye to summer than with this Lime Grilled Chicken with Vegetables and Herb Sauce. I found it in Clean Eating Magazine. If you are wondering what clean eating is. You strive to eat whole, unprocessed foods. It’s that simple. Whole grains, fruits, vegetables, dairy, meats, poultry, seafood. It’s all good as long as it’s unprocessed, as close to nature as possible. I am not obsessive about it, but I do try to eat plenty of fruits and vegetables and replace refined flour with whole wheat wheat and replace white rice with brown rice. Not too difficult to do! The original recipe was in an article having to do with cooking one night to eat for two. When you made the recipe, you were making enough for tacos the next day. All you had to do the next day was make a salsa and a crema and you were good to go. That is what I did, but since you might not want to do that, I’ve halved the recipe. This was so good! The sauce is one that I will use over and over again. It’s kind of like a pesto, but without the nuts or cheese, and it’s a little more saucy than a traditional pesto. However, it has all the flavors of a pesto, but with a little more citrus. Totally yummy. The original recipe called for you to grill the cherry tomatoes on a skewer. I just used a grill pan. It also called for cumin in the sauce, but I just wanted the fresh flavors of the lime and basil to shine through. 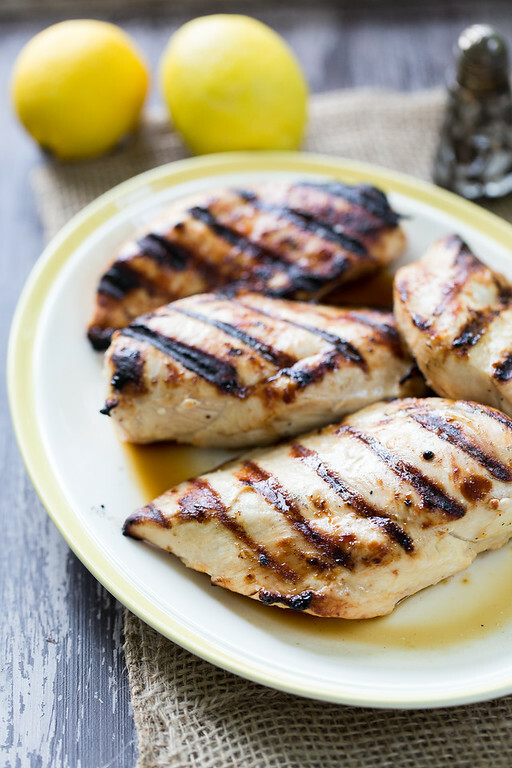 These Lemon Grilled Chicken Breasts are so easy and delicious! You’ll want to double the recipe and use them later in the week! 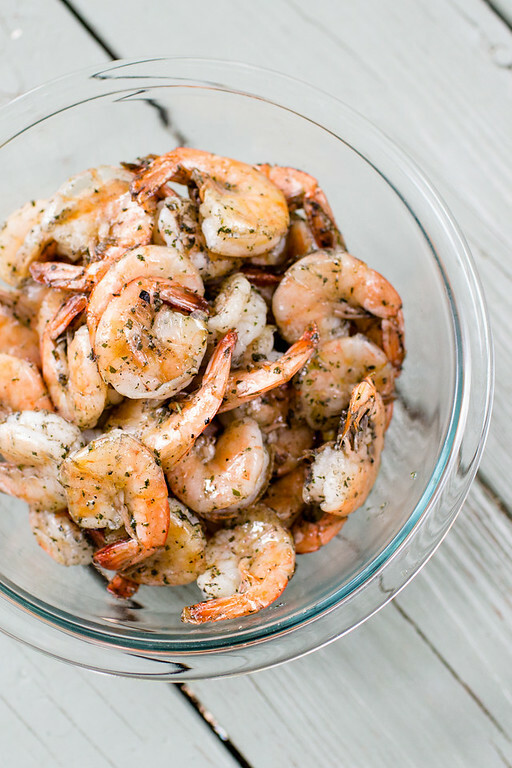 These Peel and Eat Grilled Shrimp are proof that amazing recipes don’t have to be complicated!! Everyone loves these and they are great for tailgating! Did someone say bourbon? Yes, they did! 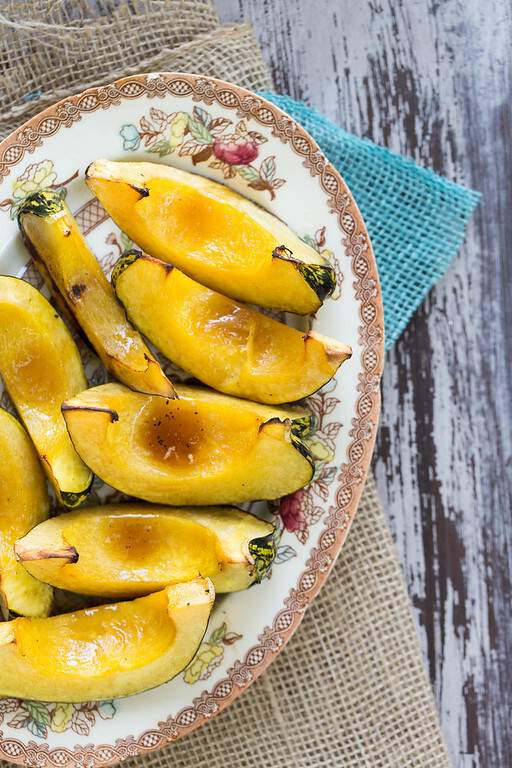 These Bourbon and Maple Grilled Acorn Squash are the perfect side dish for just about anything! I’ve even served them at Thanksgiving – to rave reviews! 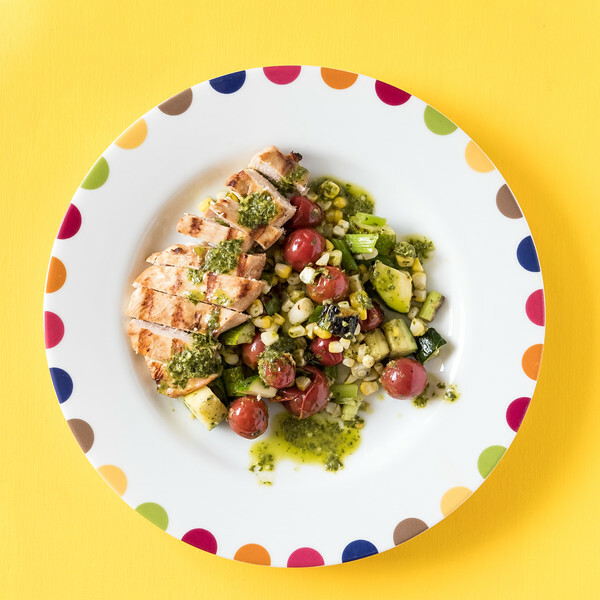 Chicken, zucchini, corn and cherry tomatoes are grilled and topped with a basil herb sauce in this Lime Grilled Chicken with Vegetables and Herb Sauce. To make the sauce, place all the sauce ingredients into a food processor. Process until smooth and then set aside. Marinate the chicken in a large bowl with the lime slices, basil, oil, garlic, soy sauce and cumin. Turn to coat the chicken. Cover and refrigerate for 30 minutes. Preheat grill to medium high and lightly oil the grate. In a bowl toss the zucchini with 1/2 teaspoon oil and 1/2 teaspoon salt and the cumin. Brush the corn with 1/2 teaspoon oil and sprinkle with salt. Cook the corn and the zucchini on the grill for around 10 minutes or until tender with grill marks. Remove and keep warm. Cut corn kernels from the cob. In a bowl toss the tomatoes and green onions wth one teaspoon oil and sprinkle lightly with salt. Place in a grill basket and grill until tomatoes are just starting to split, about 2 minutes. Remove and keep warm. Chop the green onions, or leave whole. Remove chicken from marinade. Sprinkle lightly with salt. Place on the grill and grill for about 5 minutes per side or until cooked through. Remove from the grill and keep warm. In a bowl toss together the vegetables with 2 tablespoons of sauce and divide between plates. Slice chicken and divide between plates. Drizzle with remaining sauce. This is a great recipe and a delicious dish! Thanks so much for sharing with us at Full Plate Thursday. Hope you have a great week and come back to see us real soon! Not only an easy to prepare meal but it looks delicious too!